Owned for twenty years by an interior designer and her husband, a home like this rarely comes to market. Located on a south facing lot in the middle of Sunlit Hills, the home enjoys forty mile views of Los Alamos, Sandia Peak, and the Galisteo Basin. The famed New Mexico skies are just outside the windows and off the deck and portal. Sunlit Hills is known for country style living and open spaces yet is just minutes from the heart of Santa Fe. Almost all lots are over five acres, contributing to the sense of openness, privacy, and quiet. 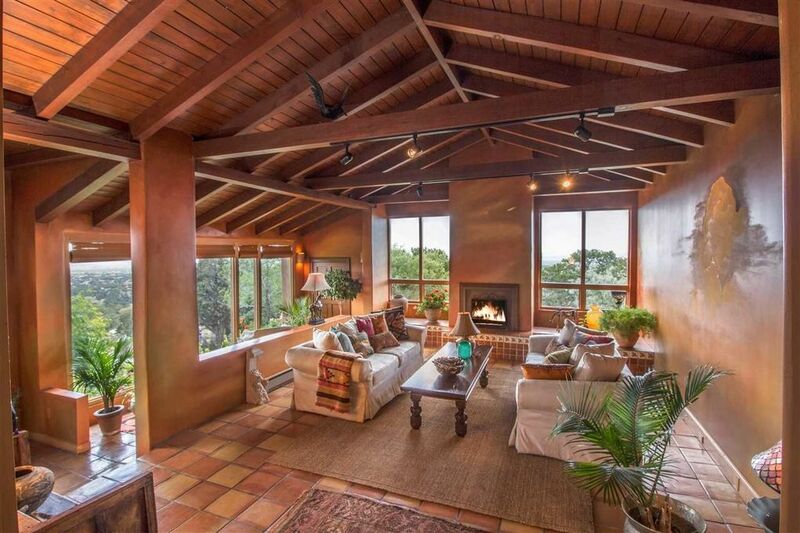 The home features passive solar design, a vaulted beam ceiling and Saltillo tile floors throughout. A master bedroom suite is on the main floor and second suite with bedroom, office, and sitting room is on the upper level. The house has a fireplace and two woodstoves. A detached building includes a studio and a workshop. Directions: Old Las Vegas Hwy., Right on Seton Village Rd, Left on Paseo Del Pinon, & Right on Sunlit Dr W.